August in Sri Lanka. Majestic elephants amble through the streets, resplendent in ornate regalia. 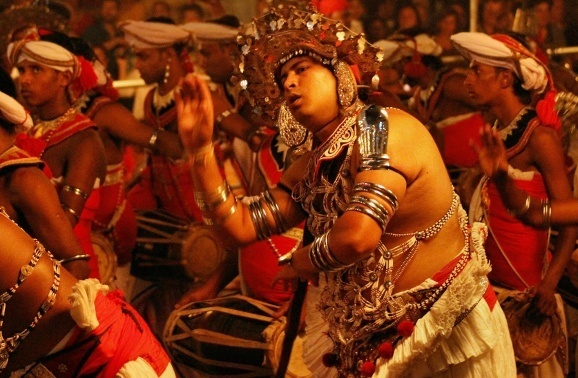 All around you, the frenetic drumming and exotic chants electrify the atmosphere. Sparkling lights and the shining gold of opulent costumes dancing just out of reach, dazzles the eye everywhere you look. 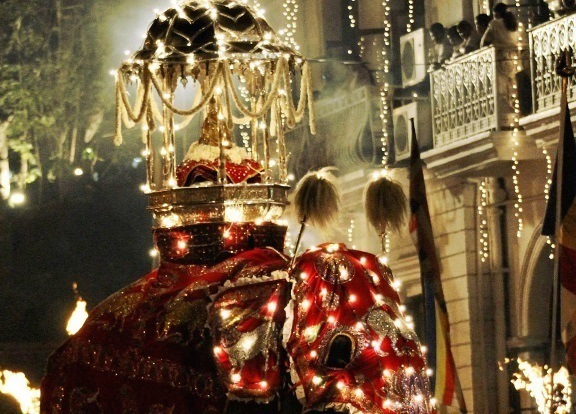 It’s that time of the year in Kandy – the Perahera, one of the most spectacular festivals of Asia Tour has begun! 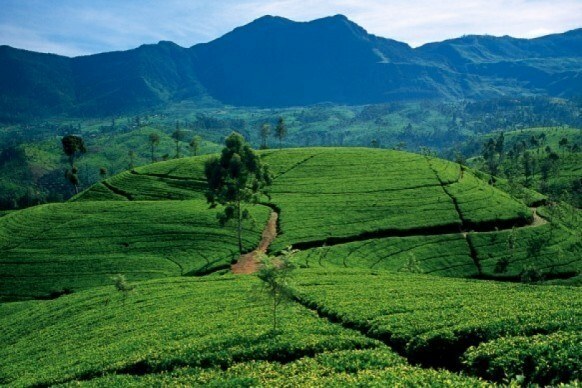 Every year, around July – August, the royal city of Kandy, cosily nestled in the picturesque hill country of Sri Lanka, is caught up in a frenzy. 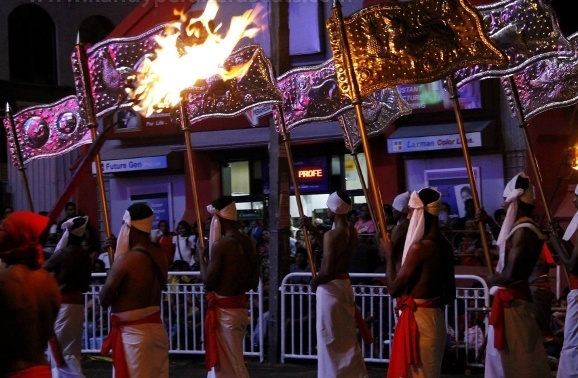 During the ten days starting from the new moon, the streets of Kandy come alive with magnificent festive processions, to pay homage to the sacred tooth relic of the Gautam Buddha – the founder of Buddhism. 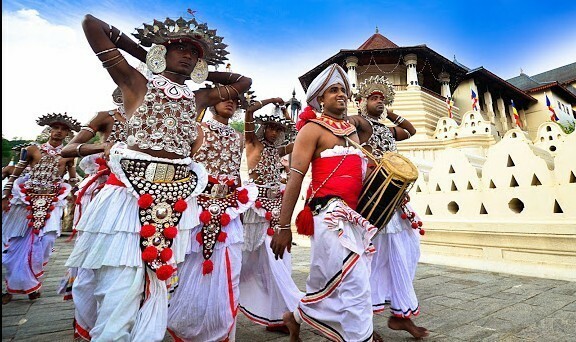 Although the origin of the Kandy Perahera is hotly debated, most believe that it is a confluence of two Peraheras – Esala, a ritual requesting the God’s for rainfall, and Dalada, which, most believe, began once the Tooth was brought to Sri Lanka in the 4th Century CE. The legend goes that when the Buddha – Siddhārtha Gautama, died, his body was consigned to the flames but one tooth remained unharmed. Over the next 800 years, the belief that whoever owned the tooth had the divine right to rule, made it a precious possession indeed! Many wars were fought, many lives lost, and many kingdoms destroyed, but somehow the tooth survived! 800 years after the Buddha’s death, hidden in the hair of princess Hemamala, the tooth traveled to Sri Lanka, which the Buddha had once described as a safe haven. The King of Sri Lanka received the tooth and its bearers with open arms, acknowledging the relic as a symbol of spiritualism. He ordered for the Perahera (procession) or the Kandy festival, to commemorate the day on which the relic arrived in Sri Lanka. Over the next few centuries, the land saw many wars. Finally, the tooth was taken to Kandy, where it has rested till date in a temple built to protect it. Whether this relic is an original however, is debatable. The servants of the Temple dress in ornate white and gold robes. Around the Temple of The Sacred Tooth Relic, called Sri Dalada Maligawa in Sri Lanka, there are four other shrines of Hindu origin – the Natha Devale, the Vishnu Devale, the Katharagama Devale and the Pattini Devale. Each of them send out their own procession during the Perahera, to join forces with the main pageant in the Kandy festival. Every year, the Kandy festival begins on the day of the New Moon and this year, the first five days of the Kumbal Perahera start on 20th August 2015. 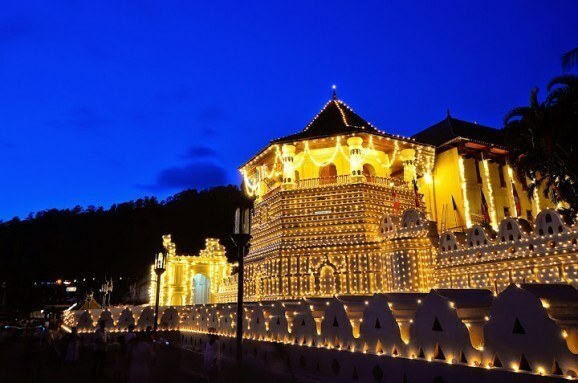 The five main temples of Kandy are decorated and each night one of the temples becomes the main attraction with exciting processions taking place from the temple premises. The Temple of the Tooth, where the Sacred Tooth Relic is kept, decorated for Perahera. Five nights after the Kumbal Perahera, Randolis, the idols of Gods, travel through the city lit up by torches in ornate gold palanquins. In 2016, the Kandy festival of Randoli Perahera will begin on 13th August and continue until 17th August. Expect hushed silence throughout the city as people wait eagerly for the Perahera procession to begin. Suddenly, the thundering noise of cannon fire is heard from the temple, signalling the start. And lo! The devotees from the Temple of the Tooth leave the shrine to begin the procession through the streets of Kandy. 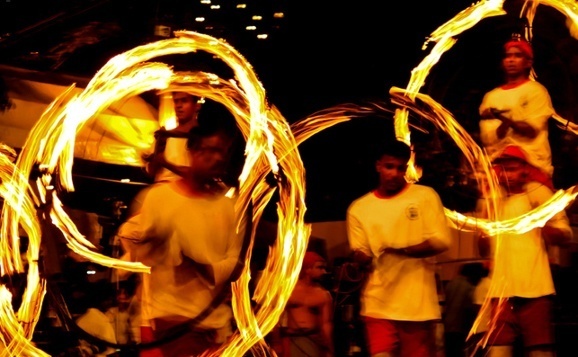 The Kandy festival begins with a train consisting of proud torch-bearers and gorgeously dressed men brandishing long whips. Each stroke of the whip breaks the silence and the glorious light from the torches bring a mystical touch to the atmosphere. Buddhist flag bearers follow in the footsteps of the drummers who come next. Musicians in silken white robes and bright red sashes belt out wonderfully exotic songs as dancers and acrobats whirl around, performing impossible feats! Finally, you see the priests and the servants of the temple, accompanied by richly decorated elephants – a wondrous finale to the magical Kandy festival. The last three days of the pageant are the highlights of the event – in 2016, they are on the 15th, 16th and 17th August. On the final day, 17th August 2016, you will find the tooth relic traveling on the back of a specially decorated elephant (the Maligawa Tusker) through the streets. This allows it to be viewed by all who have gathered to watch, with hundreds of elephants and revelers following in its wake. For the artists as well as the elephant owners, being part of this religious Kandy festival is a matter of great prestige, and participation is a tradition passed down through generations! At dawn on the last day, some worshippers from all five shrines walk to the Mahaweli River where the diya-kepeema ritual or water cutting ceremony takes place. Holy water is collected and preserved for cleaning the streets before the next Perahera. Finally, it is over and the devotees walk back to the city to end the Kandy festival with a day procession – a perfect opportunity to observe the difference between the nightly processions and the one held during the daytime. Top Tip: Book your trip well in advance to avoid accommodation availability disappointment during the key dates of the Kandy festival. 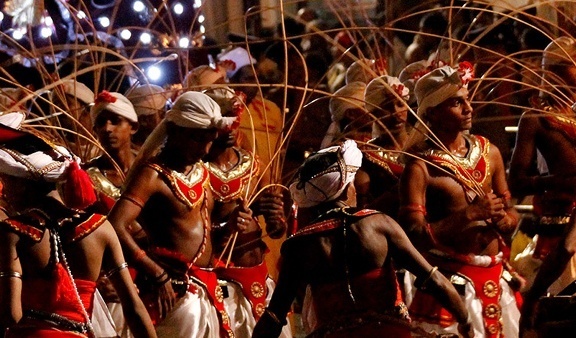 Experience the rich culture of Sri Lanka and magnificent Perahera at Kandy. Click here to contact our experts.